I had an hourglass figure at one time. Oh, it did not come naturally like the beautiful voluptuous figures of the 50’s; think Sophia Loren. No, my figure came for a device more in tune with early 1900’s. The corset. I had a corset custom made about 20 years ago and after several trial and error iterations, had a custom design that I wore for over 10 years. Not just one, but a remake, about every two years. My corset maker kept my custom pattern on file and I just call in the remake. 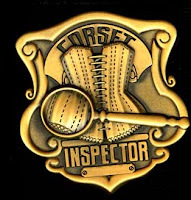 She would anticipate my need and would send an e-mail, “You should due for a new corset”. I became quite skilled at getting it on and wearing it 8-10 hours every day. Frankly, it became second nature and became comfortable after a period of adjustment. It worked well and unlike an elastic girdle/spanks it did not continue to pull in all day. It did not become uncomfortable as the day went on. What it did for your posture was amazing. Slouching was not an option. I did have an amazing hourglass figure. My restricted waist was about 28-29 inches and by today’s female standards, acceptable. However, out of proportion were my shoulders. On many occasion, I would wear a skirt in a smaller size (size 6/8) but needed to wear a larger top/blouse (size 12/14); not ideal. There were times when the waist looked unnaturally small and/or restricted. Why did I stop? Two good reasons. My corset maker died suddenly and no one was there to take over the business. I just never found another. RIP, Amy Crowder (Wasp Creation) – I miss you. I wore the last corset until it was almost a rag. I do still have it and wear occasionally. A testament to Amy's amazing work. Second, I was not going to an office every day as Rhonda. Plus, there was a third reason – It attracted attention. Although it produced an incredible figure, it is not a body shape typically seen every day. Especially in women of my age. At a party one evening someone approached me to discuss “Tightlacing” as corset wearing is described. I was happy to discuss it but realized that it was rather obvious. So now, I stick with, spanks, and wear less fitted clothing, befitting a woman of my age. Always remember - You do need a good foundation – A feminine differential.